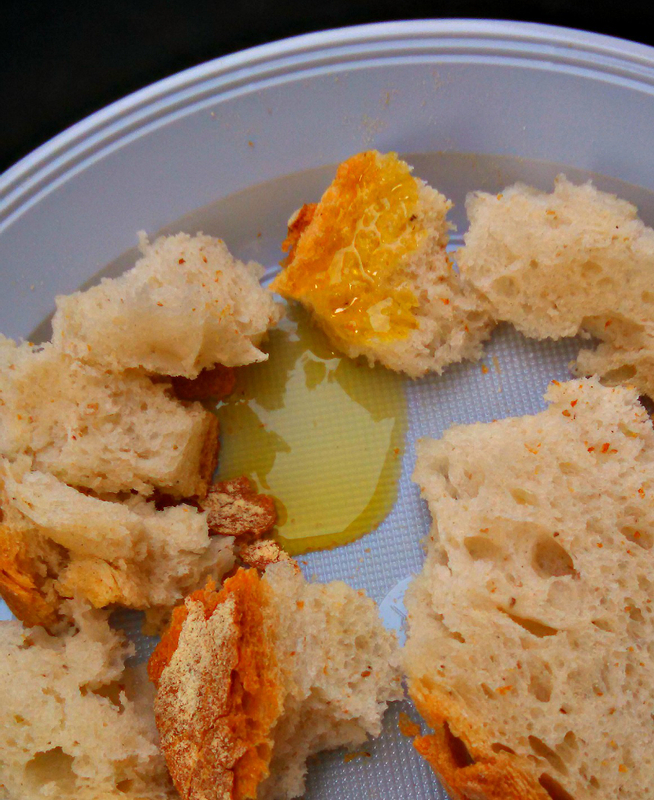 When we first arrived at this Walks of Italy food tour, the guide gave us a warning. “You are going to be eating a lot on the tour. And drinking a lot of wine – which I think is ok, because you are also going to be walking a lot.” She scanned the crowd – “there aren’t any vegetarians here, are there?” Heads shake. She looks relieved. I think to myself – this is going to be a very good day. 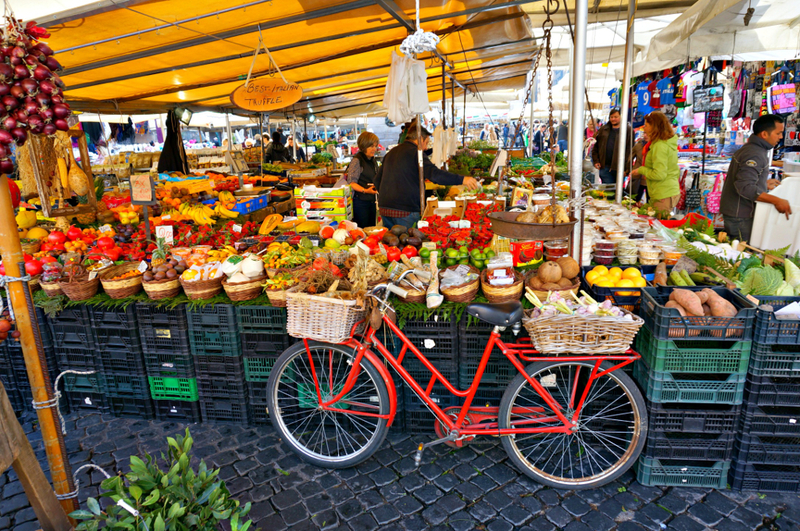 We were in Campo Fiori in the middle of a busy market with vendors selling everything from fresh vegetables, clothing, kitchen gadgets – and the things we are after: locally sourced gourmet food. We start in the middle of the market, with an olive oil tasting. The description of the oils gave as much away about the Romans’ feelings about their neighbors as it did about the products into which we were greedily dipping our crusty bread. The olive oil from the north, we were told, is mild and refined – think the delicate quiet Milan fashion model version. The locally grown oils were described as having a more robust flavor. No shrinking violet here – Romans like their flavors to be uncomplicated but bold. Apparently the Romans and their cousins in Milan don’t make good table mates, but they both make fantastic although distinctively different olive oils. Our tasting progressed as we sampled a number of balsamic vinegars, which have become very popular in Rome. 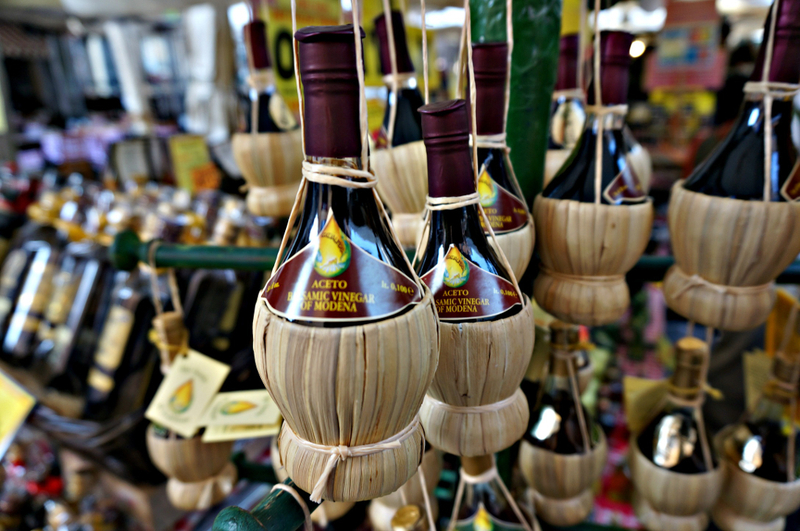 You’ll find local olive oil and balsamic vinegar on most every restaurant table (and home) in Rome. Following that we tasted several wonderful patés, including pesto from Liguria, olive tapenade, a spicy pepper sauce and a paté flavored with white truffles. Dizzy with all of the flavors and odors of the market, the only thing that seemed clear was that it was time to start drinking. It was 10:30 am, after all. And that’s what we did, in the form of some of the famed Italian Limoncello from an amazing assortment of flavors. Limoncello has a strong flavor and is not what you’d call “smooth.” It’s pretty strong stuff but the Italians argue that it is very good for the digestion. And since we were just getting started we needed all the help we could get. So we also opted to try some of the other varieties on offer, including the Chocolate Mint and Melon flavors. 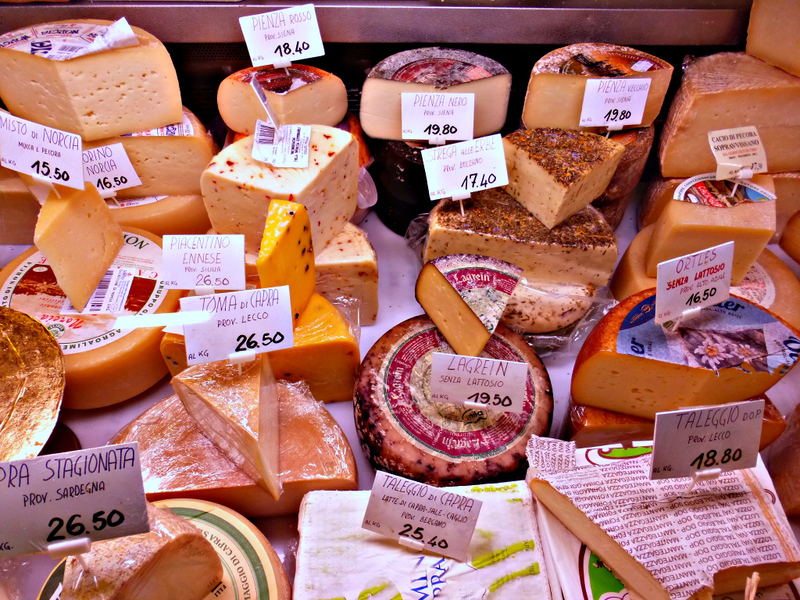 We were then off to the next stop to sample varieties of cheese. The owners of the shop selected a few varieties specially for us so that we could get an idea of the range of cheeses common to the area. They included a strong Pecorino (think crumbly Parmesan but made with sheep milk), which is used more commonly in Rome due to its availability. We also tried a softer cheese spiked with peppercorns, fresh Mozzarella and fresh Ricotta to name a few. Of course, with more wine. The next obvious choice was to find some of Rome’s famed cured meats. Which we did, in a shop that was loaded from floor to ceiling with drying links made in-house. The shop owners presented us with huge plates with samples of ham and cured sausages. With of course….more wine. Our guide, at this point, confessed that her fantasy would be to have one night, alone, locked in with all of the porky deliciousness. She shook her head, again remembering a previous tour with vegan customers. You can imagine this being an awkward moment. But not today! As we left the shop the group was decidedly happy, but all of us were getting a little full. 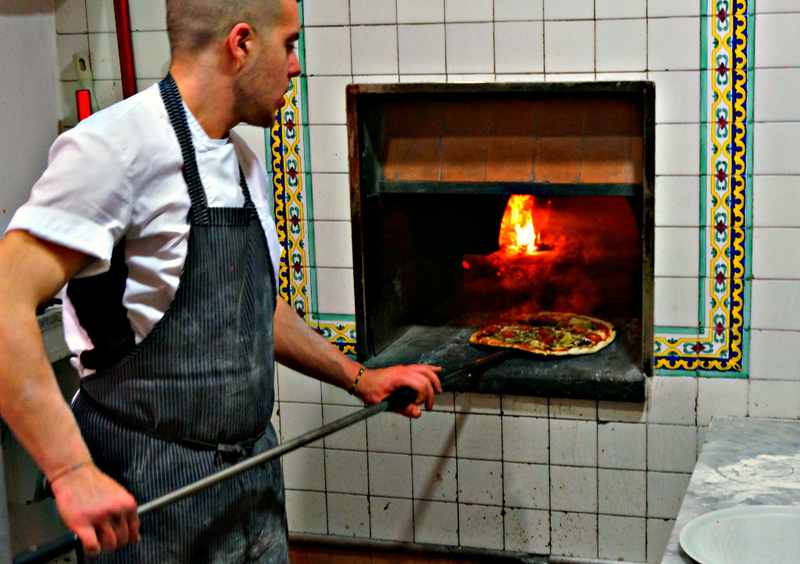 The next destination was a tiny restaurant specializing in making Rome’s favorite thin crust style pizza – and the plan was for us to make this ourselves. Did we really have it in us to make and eat a whole pizza? 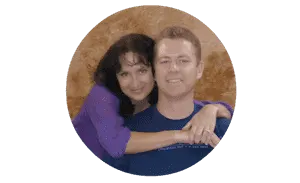 Unhindered, we turned our feet toward the pizzeria – I don’t think any of us were sure we had it in us to eat more, but we were going to try. It was that kind of day. Everyone at the pizzeria greeted us with big smiles and helped us into our aprons. We split up into 2 groups, giving us some time to digest and to busy our hands making the pizza. Which was a lot of fun. Pizza heading in for a 2 minute ride in the wood fired oven before it is ready to eat. You would think that the prudent thing to do here would be to make one pizza and share a slice. There are a few reasons why this was not going to happen. First, the crust on the pizza in Rome is very thin. It is really meant to only have a few of your personally selected topping on it (maybe 1 or 2). Otherwise it turns into a gooey mess in the center with a crispy crust – not what anyone is looking for in a pizza. Secondly, according to our guide, Romans just don’t share their pizzas. They never ask for a taste of someone else’s dish or to have a slice of their pizza. It is just not done. I was glad to have extra help with rolling out the dough from the chef, because without his help my pizza would have turned out looking like a map of Australia. But in the end I think it came out pretty well, if I do say so myself. We finished as much as we could of our pizzas (more than I’d like to admit) and then took a much needed stroll. We passed by Piazza Navona which is home to some of the most beautiful statues and fountains in Rome, and a nice place to linger. 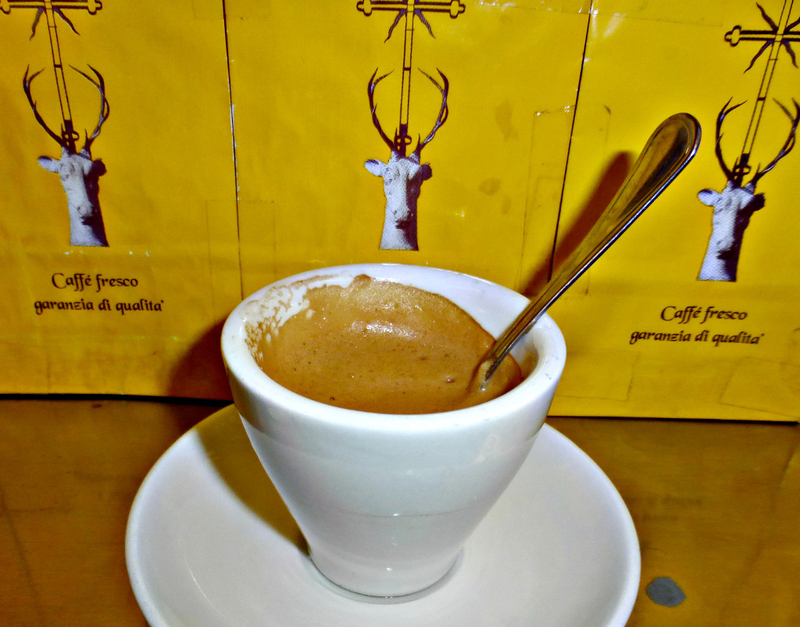 Our final stop was at a Caffe Fresco, known for having the best coffee in Rome. It looked thick and frothy and I expected a strong jolt of bitter juice. The jolt was indeed delivered, but the coffee was smooth and creamy – not at all bitter. 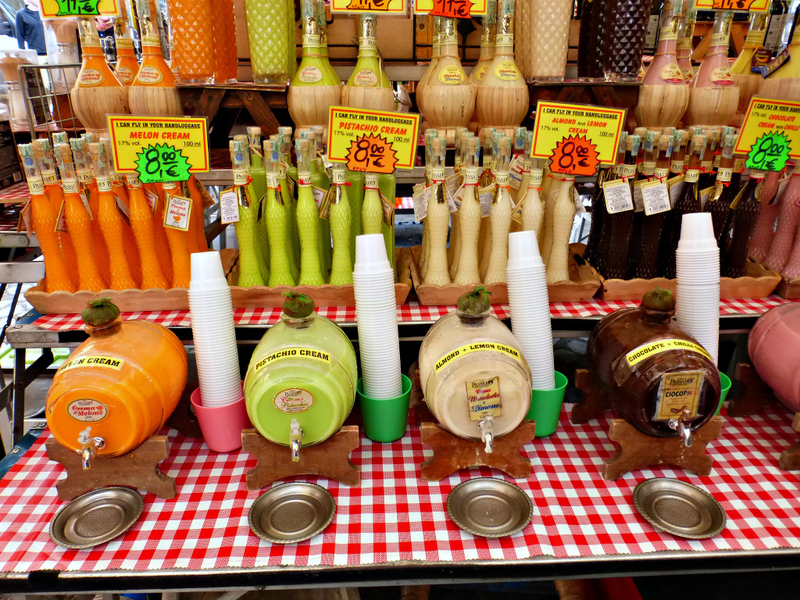 Our day gave us a sampling of some of the best flavors in Rome. If you enjoy food and feel you are up to the challenge (and, who are you kidding? Of course you are!) you can have the same experience by contacting the experts at Walks of Italy. This tour was one of the last things that we did during our time in Rome, and it left us full, satisfied, and looking forward to coming back…soon. Thank you to Walks of Italy for supplying us with this experience. (We are proud members of the Walks of Italy Affiliate Program). As always, however, our opinions and our story are our own. This is firmly on my list. I really NEED to go on a pizza tour..thanks for the idea! This tour sounds amazing! 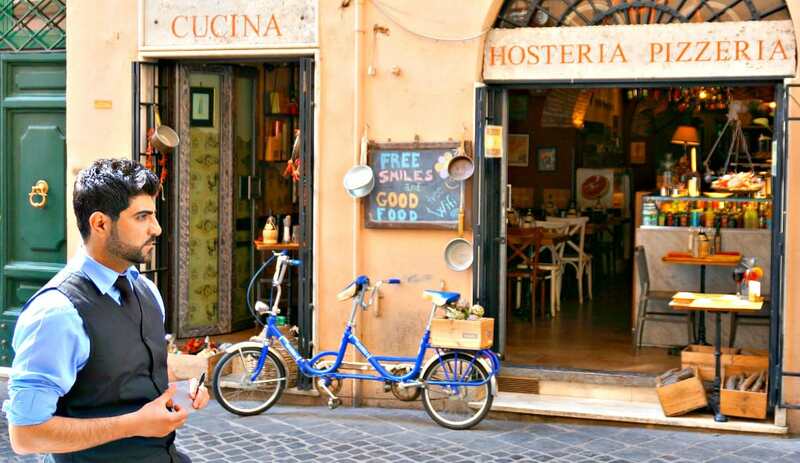 Who wouldn’t love tasting all the staple delicacies in Italy, and I’m sure that pizza was delicious! Thanks for sharing your experience! We took a stroll to Campo de Fiori on our last day in Rome just to kill time. This time we consciously avoided markets because we were travelling light (due to a crazy itinerary) and I didn’t want to stand there and stare at all the beautiful stuff I cant buy. But I’m so glad we took that stroll. The market really is wonderful, full of all this fresh produce that looks so inviting and it was lovely to watch locals shopping there as well. You guys made a great decision by taking a food tour! We definitely want to do that food tour. 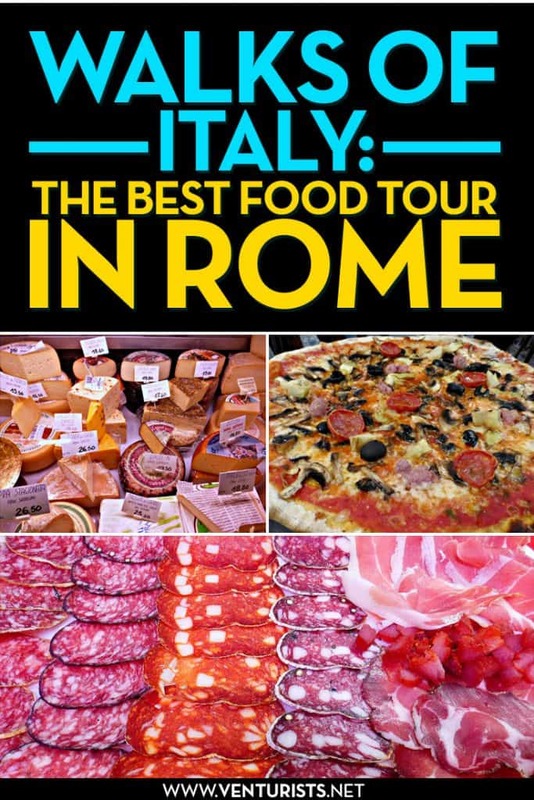 Particularly interested to try the Limoncello and of course the pizza and meats…well everything really. Walking tours are a great way to get to discover not only the food of a country, but the story and tradition behind them. I have to say I make a mean pizza but I would LOVE to have a lesson in Italy! What a great activity. I bet they have classes for kids too. Ohhhh wow. This looks absolutely amazing! mmmh…my boyfriend almost fainted when he saw the photo of the Pizza haha! A trip to Italy is definitely in the cards! Thank you for posting this! Glad you liked it! It tasted pretty good too! Great write up! I love the market area and there’s nothing like a pizza in Rome. Hubby is from there and we visit his favorite places. I’m dying for some now, pictures have made me hungry. This tour sounds amazing! 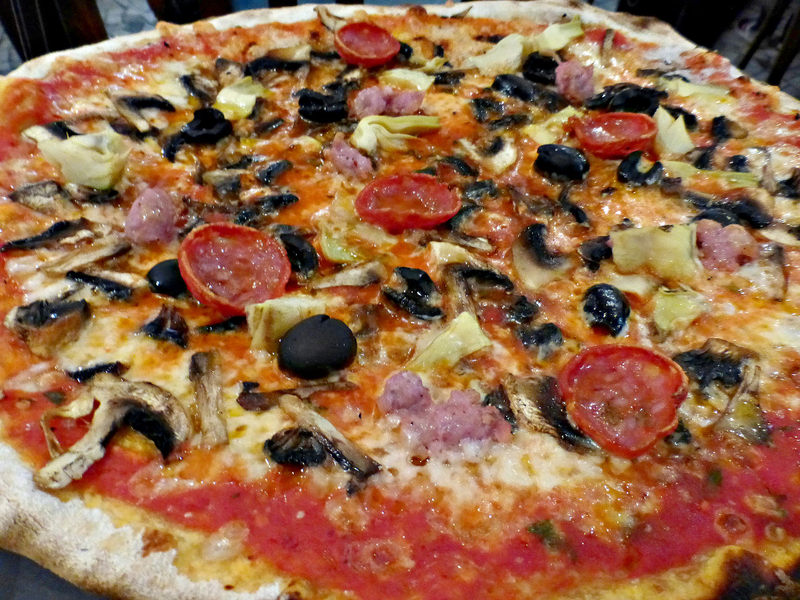 Who wouldnâ€™t love tasting all the staple delicacies in Italy, and Iâ€™m sure that pizza was delicious! Thanks for sharing your experience! Another Italian city where you can find excellent typical food is Florence, this Tuscan city is world famous for iinumerevoli works of art that are located in the historic center. In Florence there are many restaurants and trattoirie where you can savor typical Tuscan food in addition to the excellent wines of this region are appreciated throughout the world.